There’s gold in them thar … sheep??? 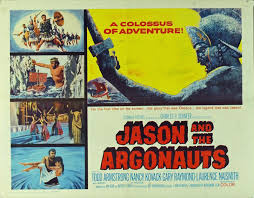 Remember Jason and the Argonauts, from Greek mythology – or from the crazy 1963 movie? Sailing to the ends of the earth in search of a Golden Fleece? What the heck is a Golden Fleece, anyway? For centuries, people have wondered. Now geologists at Ilia State University and Tbilisi University in the Republic of Georgia say they’ve figured it out. See, thousands of years ago in the ancient Kingdom of Colchis, villagers mined gold from mountain streams using sheepskins. They’d lay lanolin-rich fleece in the stream. Gold grains and flakes would float by, stick to the skin – voila, a Golden Fleece! The scientists analyzed riverbeds in the Svaneti region of the Black Sea coast – formerly the Colchis Kingdom. That’s where the mythical Jason dragged his Argonauts in search of treasure. They found geological evidence that those streams once carried abundant, fleece-able gold. Enough to warrant a perilous voyage, fraught with seven-headed hydras and vulturous harpies! Historical records support their theory. Well, not so much the hydras and harpies. But I’ve seen the movie – in “Dynamation!” – they’re all too real!